Handel is arguably the greatest composer of Baroque opera, and “Giulio Cesare in Egitto” is arguably his greatest opera, so any production of it is guaranteed to create great excitement among Baroque opera fans. It is also a challenge for any company determined to do it justice. It is long – if no cuts are made, it runs four hours, and that doesn’t include intermissions – and it requires virtuoso singing of the highest order from six of the eight singers in the cast. It is one of my favorite operas and I have been waiting for this Boston Baroque version of it all season long. With some uneasiness. The two productions of it I’ve previously seen – the famously sophomoric Peter Sellars version set around the pool of the Cairo Hilton during wartime that was also notable for some fine singing by mostly Boston-based singers, and a low-concept version at the San Francisco Opera featuring two superstar countertenors, Bejun Mehta and, in the title role, David Daniels, then at the height of his powers – were only intermittently successful. The fact that Boston Baroque had cast soprano Susanna Phillips, who has proved to be a thrilling singing actress here on previous occasions, as Cleopatra – a role debut for her - and that she was being joined by other estimable Baroque vocal specialists, particularly mezzo Jennifer Rivera, who a couple of years ago brilliantly interpreted Penelope in Monterverdi’s “Il ritorno d’Ulisse in patria” with Boston Baroque, gave me great hope that this might be the production that would finally do the great work justice. Well, it both did and it didn’t. 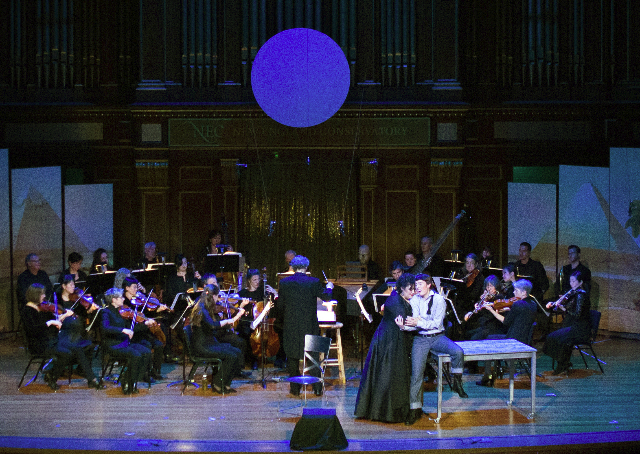 Boston Baroque productions are semi-staged, but that hasn’t prevented them from being thoroughly dramatic. Indeed, I’ve thought in the past that its practice, one shared by the Boston Early Music Festival (BEMF), might be the best approach to staging Baroque opera, the relatively small orchestra at stage center surrounded by the singers who bring the drama to life in front of, behind and on each side of it. But it requires a production with no superfluities. In the past, under stage director Mark Streshinsky, for instance, that was achieved. With “Giulio Cesare,” the work of the young director Mary Birnbaum, whose previous experiences were mostly at the Juilliard School, it was not. There’s a lot going on in the opera, but Birnbaum didn’t seem to be able to let it unfold on its own terms. Even more important than moving the actors around the limited stage space are the sets and costuming. Even as they share the concept of small scale semi-staged opera, the BEMF and Boston Baroque diverge in this area, the BEMF favoring rich, elaborate, period costumes, Boston Baroque favoring contemporary or eclectic costuming. This has worked well for Boston Baroque before. Its production two years ago of Handel’s “Agrippina,” which starred Phillips in the title role, was brilliant, with apt and pert contemporary costumes. Last year’s “The Magic Flute” failed because the rented costumes seemed to have been derived from too many different productions. This year, the costumes, although apparently designed or coordinated for the production by a single designer, Amanda Seymour, are also a hodge-podge. While Phillips looked fabulous in the series of gowns and wigs she wore – a beautiful young woman, she would have looked fabulous in a burlap bag – Caesar looked butch in his black military drag and Cornelia was appropriately dressed as a widow in black, other characters looked as if they had raided Goodwill just an hour before the performances began. Sesto (Sextus), the impetuous son of the murdered Pompey and Cornelia, looked for no apparent reason like an old time newsboy in his rolled jeans, boots and cap, and Nireno, an aide to both Cleopatra and Tolomeo (Ptolemy), wore a schmatte wrapped around his waist as if he were a hippie on his way to an ashram, and an incongruous fedora. Seymour lost an opportunity to show a little flesh, an increasingly common practice in opera about which I’ve heard no complaints, costuming two supernumeraries in long robes. From Egyptian art we know that It was common for men in ancient Egypt to wear loin cloths with pectorals. Why not dress the two young men, who were lithe and slim, in such historically authentic garb? The sets, attributed to Grace Laubacher, were serviceable – large vertical panels with a view of the Nile appropriated from a 19th century painting on one side, roughly textured gold paint on the other. In the famous Parnassus scene, the choir screen high above Jordan Hall’s stage – naked boys blowing horns – was illuminated with pink light to fine effect. Boston Baroque music director Martin Pearlman led his forces, 30 players strong, briskly, and he judiciously cut da capo repeats of a number of arias, turning out a production that lasted about three and a half hours with one intermission. Still, in a long opera like “Giulio Cesare,” which is full of exquisite arias and ensembles, it’s the singing and acting that makes a production work, not the sets and costumes, no matter how important they are. 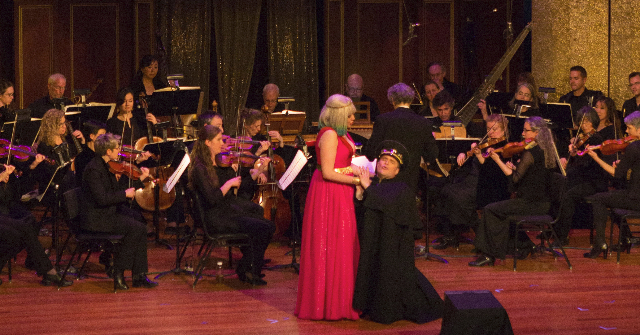 On that score, Boston Baroque’s “Giulio Cesare” was more successful. But first a little recap of the story, which should be familiar to those who remember the ancient history they might have read in school. In his quest to conquer the world, Caesar has come to Egypt, where the ancient but weak kingdom is jointly ruled by a king and a queen, the brother and sister Tolomeo and Cleopatra, who hate each other and strive by any means necessary to become sole ruler. As a gift to Caesar on his arrival, Tolomeo has had his Roman rival Pompey’s head cut off and delivered in a box. Caesar is repulsed, and Cornelia, Pompey’s now widow and her son Sesto, who just happen to be on hand, are devastated. The plot has been set in motion: Cleopatra seeks an alliance with Caesar against her brother, falling in love with him in the process, Cornelia and Sesto seek revenge on Tolomeo, Tolomeo wages war against the Romans, and subsidiary characters plot to advance their own cases. The distraught Cornelia is sought as a mate by both Tolomeo and Achillas, his general. Twice, as a romantic interlude is about to be commence, first between Caesar and Cleopatra, second between Tolomeo and Cornelia, servants invade the scene calling the male to battle, which suggests that the underlying theme of the work is that war trumps love, and despite the happy ending – Tolomeo is killed and Caesar and Cleopatra are united in love – strife will soon return to Egypt’s bloody sands. This story, based on real historical characters – there are no gods or goddesses or mythological figures – is filled out with some of the most vocally ravishing and dramatically diverse arias and ensembles in all opera. There are songs of flirtation and love, happiness and despair, hatred and revenge, loyalty and disloyality, pity and self-pity, the drive to power and control. Like the historical characters they represent, the singers express the full panoply of human emotions. Handel, who was at the height of his powers as a composer in 1723 when he wrote “Giulio Cesare” and at the height of his popularity in London, where he single-handedly and by pure force of will made Italian opera the hottest form of entertainment in town, seemed to be self-consciously composing his masterpiece. “Giulio Cesare” is one of his longest works, it requires both the largest orchestra and singers who are capable of singing virtuosic music without rest while bringing to life a thrilling drama. In London, he had assembled the greatest singers of his age; three of them he had brought with him from Italy, the castrato Senesino, who sang Caesar, and the sopranos who sang Cleopatra and Sesto, Francesca Cuzzoni and Margherita Durastanti, respectively, were the most celebrated singers of the early 18th century. Few figures in opera exhibit more of a range of emotion in her arias than Cleopatra. The music Handel wrote for this ambitious teenager is amazing in its complexity of feeling and even more amazing in its beauty. Handel wrote eight arias for her, at least four of which deserve to be ranked among the greatest ever composed. With her easy smile Phillips is a natural comedian and in her first couple of arias she excels as spoiled teenage Princess of the Nile delta as she teases her brother. But she has more to show than her – and Cleopatra’s - natural coltishness. I remembered how I thought when I first heard Beverly Sills sing Violetta that in the first act, she was a great party girl, but that she would never be able to make us cry in her third act death scene. Instead, like half the audience I was left sobbing. Let me add that it is a sound unique to this scene: I’ve never heard anything quite like it anywhere else. Visually, however, the production left something to be desired. At the top of the stage, under the organ pipes, Phillips emerged from behind golden wings held up by her two attendants. It was too cheesy, a little too Real Housewives of Dallas to evoke Parnassus. I listened with delight but visually conjured Claude Lorrain’s “Apollo and the Muses on Mount Helicon” at the Museum of Fine Arts. This music is the perfect accompaniment to that sublime painting. Handel knew he had a good thing with this insinuating and dreamlike theme, which he introduces before Cleopatra appears, causing Caesar to wonder what magical sound he is hearing. Phillips sang the aria with superb musicianship, melding her voice into the instrumental web like a collaborator rather than a superstar soloist. Understanding how she is just a part of a musical composition, if indeed its focus, she restrained herself with modest but apt ornamentation. After she and Caesar are interrupted in his bedroom with news that Tolomeo’s men are on the way to kill him, Cleopatra sings the most emotionally affecting aria in the opera, “Se pieta di me non senti” (If you feel no pity for me, just heaven, I shall die). We have watched Cleopatra grow up, from obnoxious teenager, lording it over her out-classed brother, to seductive lover to, now, a desperate woman who bargains with the gods to save her. Phillips put across the long aria – 10 and a half minutes on one recording I have – with full command of each of the emotional jolts it contains, leaving the audience feeling as devastated as she was. And it earned her the biggest ovation of the afternoon. The other aria that vies with “Se Pieta” with emotional depth is the third act “Piangero la mia sorte” (I shall lament my fate). Phillips seemed to dial it back a little, realizing that she couldn’t deliver a second aria with the same intensity she brought to “Se Pieta.” She began soberly, singing while standing still, but in the B form of the aria, she became an active resister of her incarceration, tearing at her two guards like a pitbull. When the aria returned to the original theme, she sang with greater resignation, contributing ravishing ornamentation. 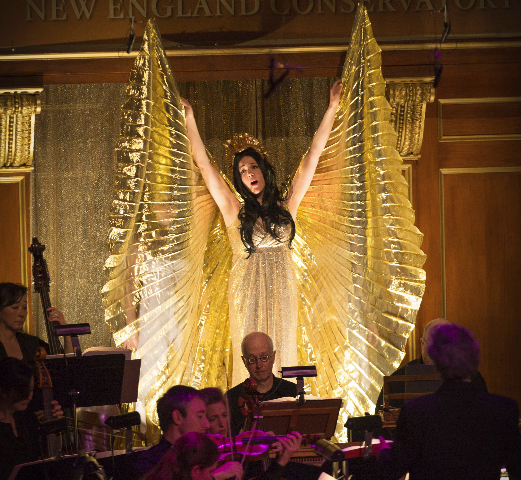 Phillips made her role debut as Cleopatra with Boston Baroque. It is a complex role that makes extraordinary demands on a singer. She gave a fine performance, perhaps, despite the profundity she was able to find in “Se pieta” and “Piangero,” a little light – she is a naturally sunny singer. She will grow into it. By the time she sings it at the Met or Covent Garden, she could well be the great Cleopatra of her generation. And we’ll be able to say we heard her here first. Of course, Phillips was only one member of an excellent cast of singers. She was well matched by countertenor Lawrence Zazzo as Caesar. How to cast roles originally written for castrati is a persistent question today for companies that want to produce Baroque opera. The standard solution is to use countertenors, although in the recent past when singers in that vocal range were rarer than they are today mezzo sopranos were often employed. In any case, Zazzo, who has sung Caesar in Brussels, Paris and London, was a great choice by Boston Baroque, where he was appearing for the first time. In his black uniform and cap, he looked the part of a world conqueror, and he sang with power and refinement. He was most moving in “Alma del gran Pompeo” (Soul of great Pompey), a meditation on the vanity of human wishes and fate delivered as he contemplates the urn that contains his great rival’s ashes. And he contributed some nice ornamentation to the horn-accompanied “Va tacito,” in which he compares military strategy to a hunter, but he was not terribly convincing in it as a whole. He was terrific, however, in the Act II aria “Se in fiorito” in which he sings a delicious little duet with a violin. And he totally seduced the audience in the last act in the aria, “Aure, deh, pieta” in which he sent his song out into the theater on a single breath of astonishing delicacy. As Sesto, Jennifer Rivera did not match her portrayal of Penelope here a few years ago, but how could she have? Penelope might be the role of a lifetime for her. She was fine, however, in her two first act aria revenge arias “Cara speme” (Dear Hope) and “Svegliatavi nel core” (Arise, ye furies), in which Sesto pledges to revenge the murder of his father, singing with heart-breaking resolve. (Basically, Sesto is a one-dimensional character seeking revenge throughout the opera, achieving it at the very end when he kills Tolomeo.) Accompanied by the theorbo (a large lute), in “Cara speme,” Rivera showed how arias emerged from the madrigal, i.e., song tradition, without slighting its deep feeling, adding perfect, non-forced ornamentations to the basic vocal line. And in the final scene of the first act, with Ann McMahon Quintero as his mother Cornelia Rivera delivered a duet, which are rare in Baroque opera, that tugged at the heart: “Son nata a lagrimar/nato a sospirar” (I was born to weep/I was born to sigh). Quintero held her own in the duet, but despite her deeply embodied mezzo, she was somewhat weak-voiced in her solo outings, at least compared to the rest of the cast. Tolomeo was sung very ably by young countertenor John Holiday, who, like Phillips, dramatically captured the immaturity of the character he’s playing whose playpen happens to be the world. His voice has a wide range, with almost baritonal lows and the thrilling high-highs of the countertenor in his prime. In a smaller role Boston-based baritone David McFerrin as the Egyptian general who changes sides, paying with his life, sang with a gravelly power, making each of his appearances count. And in even smaller roles baritone Jacob Cooper as Curio, a Roman tribune, and countertenor Douglas Dodson as Nireno, the confidante of the feuding brother and sister duo who rule the Nile, were both fine. A good experience in the theater with some real satisfactions, namely musical, which is what’s important after all in opera, Boston Baroque’s “Guilio Cesare” still leaves me without having seen a great production of a favorite work. Is it a work perhaps so great that it’s impossible to stage so that it satisfies all desires?